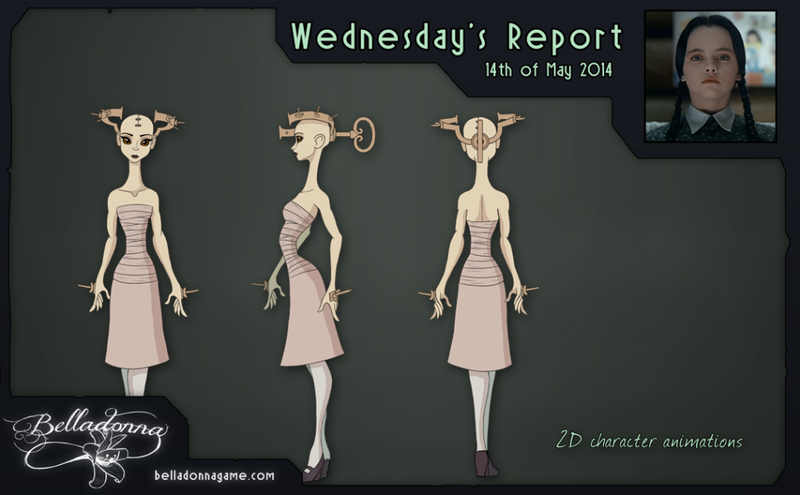 I have spent a long time working on an animated 3D character for Belladonna. The idea was to build a character in 3D and pre-render it in several different angles, because it is easier to make one 3D animation and render frames, than to hand draw every single frame in a 2D animation. 3D does however give a whole bunch of other problems. For one thing, the 3D renders need to be done from a specific camera angle and the scenes in the background are not locked to that exact a perspective: the character blends fits in the environment to a different degree in different rooms. Another problem is that the animations do not blend into each other. In a real time 3D engine the computer will automatically tween between for instance a walk cycle and an idle animation when you star walking. But since these are pre-rendered frames, the animations will just snap. The big problem is that we are so used to see very good 3D animations, so when they are not top-notch we expect them to be. 2D animations are more limited, in a way, especially when it comes to perfectly realistic lighting and other details. This means a 2D animation can look good, even if it is not perfectly realistic. The point is, I have now totally remade all characters in 2D. After five month of work on the 3D character and animations, I just sat down one weekend and made all the animations in 2D instead! That’s game development for you. But the truth is, I could not have done these 2D animations so quickly had I not spent the months working with the 3D character. Because I did, I know every detail of the characters body, and I am intimately related with all the issues and tricks I have found along the way. I am by no means a good animator, and as far as animations go, the ones I have created now are not very good. They are stiff and twitchy, and most part of the body is completely static. Chances are I sit down again and brush up as many animations as I can, making them more lively and getting more limbs to move around. Belladonna is from now on completely made in 2D. It looks more indie, more artistic and a lot better. Even if the animations are a bit wonky and stiff. This entry was posted in Wednesday's Report on May 14, 2014 by admin. Okay, so you woke up in a laboratory and there is no one around to ask what the heck is going on. Lucky for you, the people involved in the events leading up to your peculiar predicament have been very thorough in their documentation of the process. 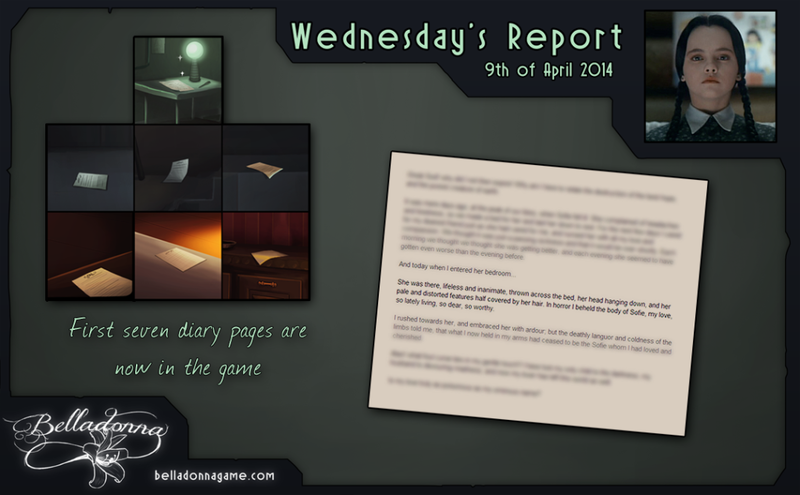 The game will have something like 16 letters, or diary pages, written by several different characters, and this is the very heart of the game. I am stretching my very modest literary muscles to the limit here, trying to produce a gripping and thought provoking story, and trying to do it in the style of a 19th century gothic horror story. I am even using direct quotes and phrases from M. Shelley’s Frankenstein novel, to set the mood. Because I care so much about these letters, they are taking a long time to produce. A large part of the game is actually playable and functional by now, but it makes no sense to play it as the story, intended to be imbedded in the gameplay, is not yet implemented. This week I have made an effort to at least rig up the first seven letters of the game. Now around half the game can be played and made sense of. This entry was posted in Wednesday's Report on April 9, 2014 by admin. 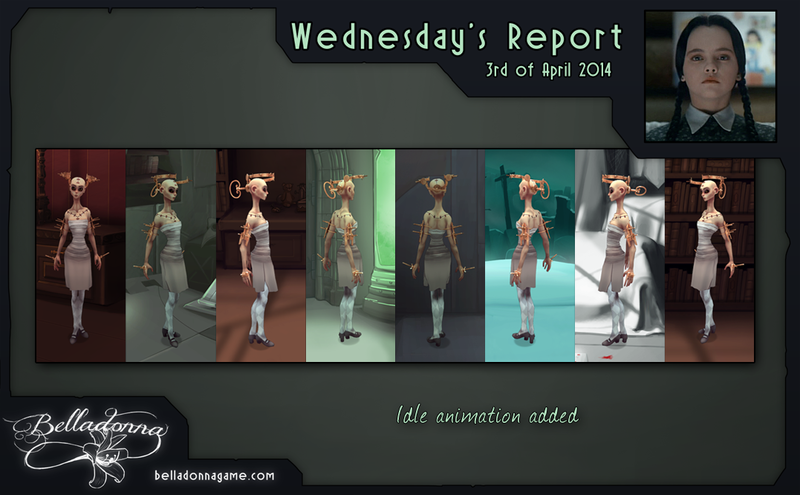 The idle animation of the player character has now been added into the game. This means an animated 3D character rendered in eight different angles! So far there’s only the idle animation, and no walk-cycle. It looks really strange when she moves by gliding over the floor. That worked well with the primitive placeholder character I’ve been using, but with this final character you expect more. The walk animation is not finished yet, so we’re still waiting for that. I am also not entirely satisfied with how it looks right now. A big problem I have is matching the perspective of the 3D renders to the 2D painted environments. Especially the blob shadow at her feet got a bit weird. I have a few other minor details I want to fix, which means I will have to render all the frames at least one more time. This entry was posted in Wednesday's Report on April 2, 2014 by admin. 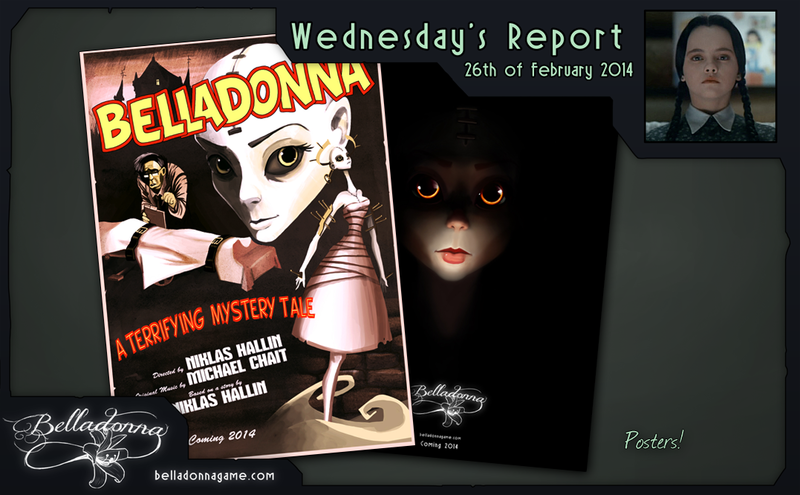 I am battling a spring cold and fever, and the progress in Belladonna is slow. I have however added a handful of items since the last update. 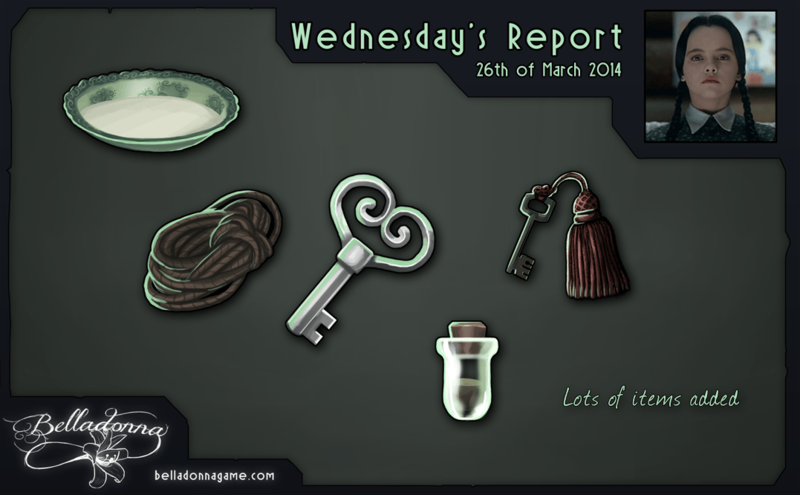 This is a point-n-click adventure, and finding items to solve puzzles is a big part of the game. 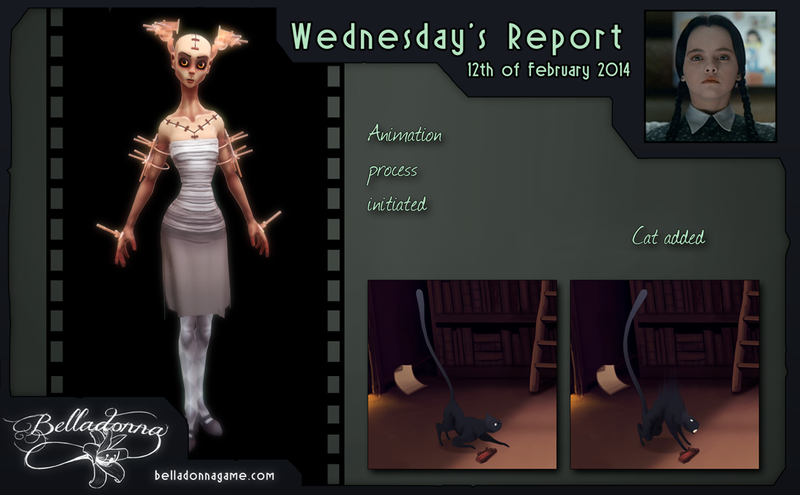 In games such as Monkey Island the style of the puzzles is often to combine a rubber tire with a cactus to create an enormous slingshot, but Belladonna is a darker and more down to earth game. (It can still be funny at times, but the humour doesn’t lie in the absurdity of the puzzle solution.) In Belladonna I have tried to create puzzles that would naturally occur in an old haunted mansion. This means a lot of locked doors, and admittedly a majority of the puzzles consist of finding the key to unlock them. But fret not! There are other puzzles as well, and some might even have you re-evaluating your suspension of disbelief. But no cactus catapults, I’m afraid. This entry was posted in Wednesday's Report on March 26, 2014 by admin. The point of the 1930s Frankenstein poster I made was that it was a Frankenstein reference. But then I thought it would be cool to make a Belladonna poster in the style of the old Tales from the Crypt (and similar) horror comic covers. 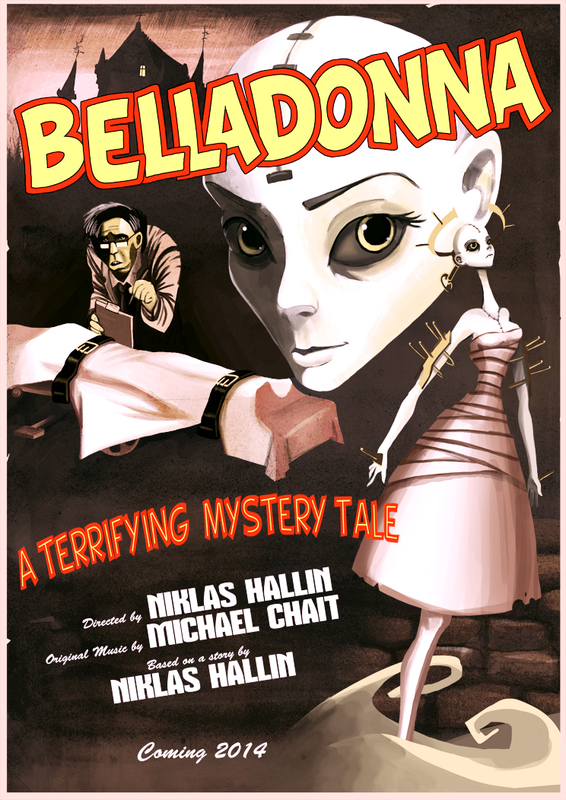 I’m continuing the tradition of making Belladonna posters in various horror styles, and I’m having a blast. The Tales from the Crypt poster has nothing to do with the story of the game. These two characters never really meet like this, and though the doctor is indeed murderous he would never attack someone wielding a blade. He’s the kind of guy who silently poisons you. Once I had already thrown all respect for the game’s story out the window, I figured I might as well keep going, and so I created the Modern Horror Movie poster. Making a movie poster today is fairly simple. Zoom in on a human eye, desaturate everything and overlay a lot of metal scratches and dirt layers. I created this poster in about 15 minuets. Interestingly, and perhaps not so surprisingly at all, the Modern Horror poster – stooped in irony, tagline intentionally as lame as possible – got significantly more upvotes/likes/favourites online. Belladonna is largely a point-n-click adventure game, but it will also feature a Mass Effect/Banner Saga style dialog tree. I have no art for the scene, and I have not written the lines for the dialog, but this week I started working on the technical aspects of connecting dialog options with the correct responses and so on. Visionaire has a tool for this, and making the actual branching tree is very easy. The unexpected problems I am having is formatting the text properly and making it appear at specific positions on the screen. I have a designated area for dialog text, but right now the lines appear floating mid-air somewhere in the room. This entry was posted in Wednesday's Report on March 12, 2014 by admin. 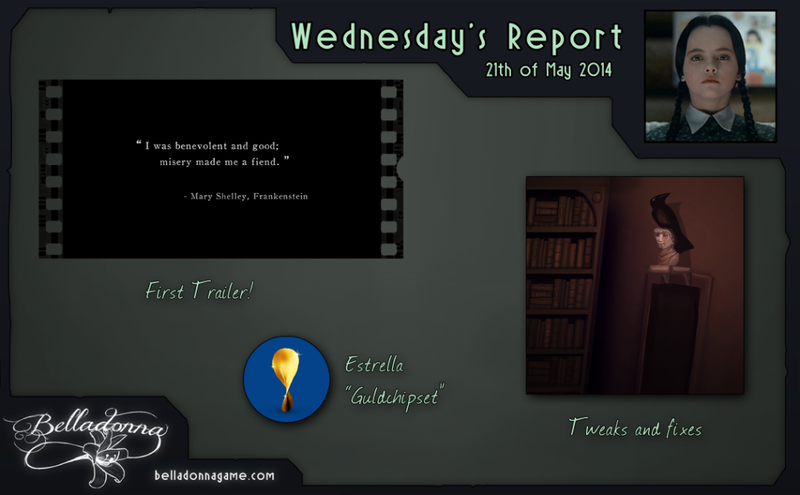 Last weeks Wednesday’s Report was a bit empty and dissatisfying. The reason for this is that a lot of my time goes to working with things that I cannot show to the world. Sometimes it’s because the information is too spoiler heavy, but most of the time it is simply because I’m going in circles with technical issues. Getting an animated character into the game has taken a lot longer than I had anticipated. This is not something overly complicated to do, and I have done it several times before, but for this project it simply doesn’t want to play nice. I do not have anything interesting to show on this front, but I have been working with it, and right now it looks like the barricade might dissolve a little shortly. I am optimistic. I have also started to work on the Master Bedroom scene, which is actually the very last big room in the game. There are a one or two minor ones after this is done, but this room is something of a “final boss room”, the story’s climax scene. So that’s exciting. This entry was posted in Wednesday's Report on March 5, 2014 by admin. It’s a slow news week. I have contacted a hobby drama/theatre organisation here in Stockholm and asked if anyone was interested in doing voice acting, but I have gotten no reply. I and Stina Boberg are also struggling with technical difficulties with the character animations. Lots of work, very little progress. 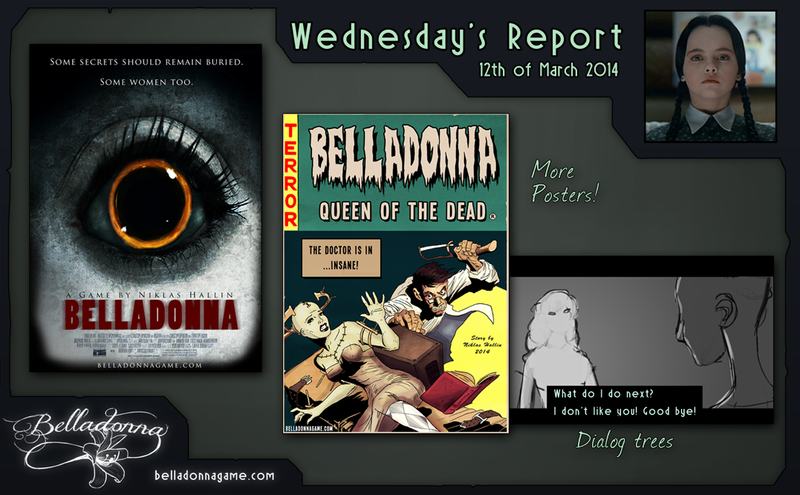 A while ago I played around with some movie style posters for Belladonna. I have no direct use for them in mind, but it’s always good to have marketing material. Also, this old school style poster is a direct homage to Frankenstein posters from the 1930’s! 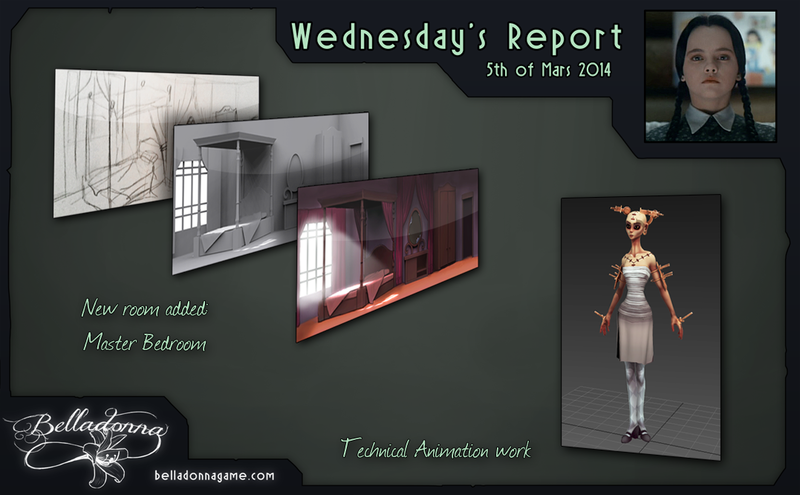 This entry was posted in Wednesday's Report on February 26, 2014 by admin. 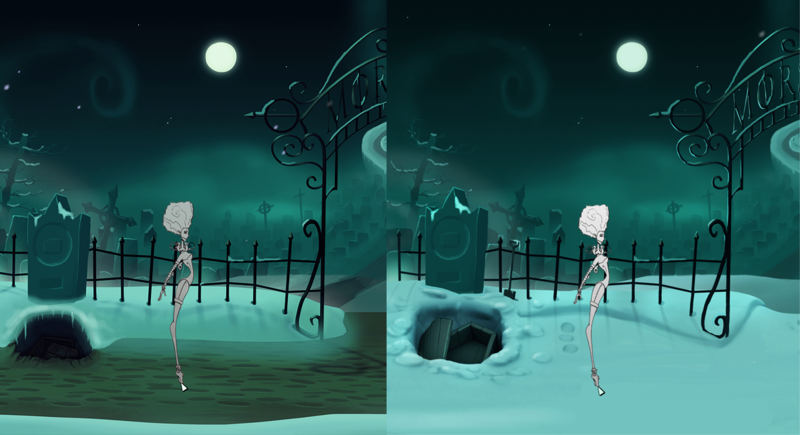 One of the levels is set in a huge, spooky graveyard. It is meant to be an epic outdoors environment shot, but it also has a grave which has been dug up and grave robbed. Problem was, everyone who saw this scene had to ask what that thing in the middle was. 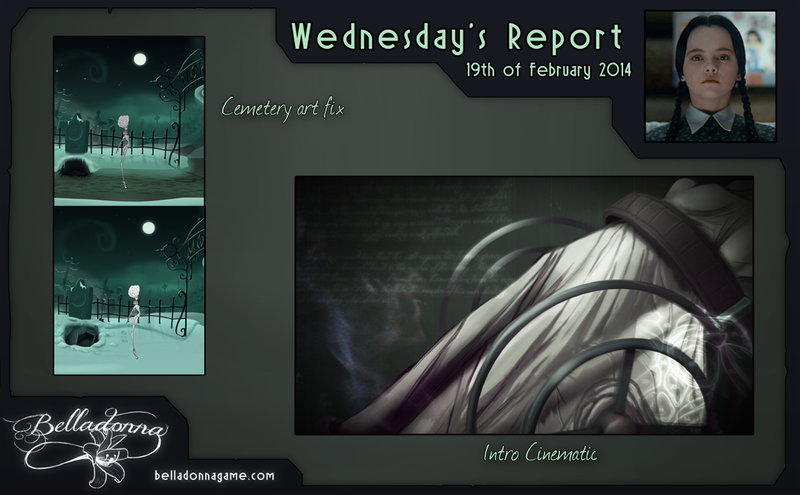 This week I have revisited the backgrounds and hopefully the open grave is now a bit clearer. Two weeks ago I talked about a storyboard for an intro cinematic. This week I have started the work on turning that into an actual film. I’m not nearly finished yet, but I have worked quite a bit on the first half of it. This entry was posted in News, Wednesday's Report on February 19, 2014 by admin. Though this is a 2D game I am creating a 3D model of the main character. The idea is to animate it and render the frames into 2D sprites, in order to avoid having to draw every single frame by hand in eight different angles. When it comes to animations I have asked my friend Stina Boberg for help. She is a very good animator and I am excited to have her assistance in this endeavour. There is still a long way left until we have a finished character walking around in the game, especially the considering the time it will take for me to render all this and importing the frames correctly, but during this week we have started to really bite into the animation work. On a related note, this is actually precisely what I have been working on myself. The cat model I mentioned a few weeks ago has now been rigged and skinned. There is indeed more than one way to skin a cat! With a proper rig I could animate the cat, render it just as planned and put inside the game. The cat will wag its tail and play with a small object it has found somewhere. If you go near it, however, it will be very angry and aggressive, and it will not let you near its treasure. Cats have always been thought of as having very keen senses when it comes to the supernatural, and this cat reacts strongly to the phenomena Prometeans the Created calls “Disquiet”. You are playing as a reanimated corpse, and the cat senses how your very existence is just fundamentally wrong. The cat gives you a taste of how you will be met with nothing but hate from living creatures, but the question is; how will you handle that? This entry was posted in News, Wednesday's Report on February 12, 2014 by admin.